You'll recall, because you are deeply fascinated by this, that the last set of acoustic guitar strings I put on my Martin were, in fact, Martin strings. New strings, aren't you excited? And I felt bad about not putting new strings on the guitar I lent them. But if I put new strings on it the day of the show they might have trouble staying in tune. Also, they could be too bright. So I didn't, then. But I did, just now. The strings might be a tad bright for a flat pick. That's a "might" be. And if you used the internal pickup in the guitar they'd almost be "electric-y". So it was maybe a good choice not to restring. I dunno. 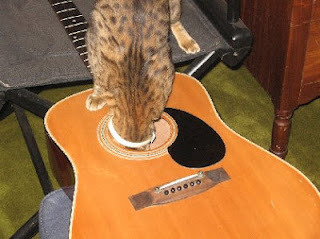 Martin has a "care and feeding" guide for acoustic guitars. They suggest a temperature of 72-75 Fahrenheit (which seems a bit hot to me) and 45-55 percent humidity (which seems a bit dry to me.) But that's just me. FOUR SHOTS rang out in the night outside the piano lounge on the Lower East Side of New York. The drummer of the heavy rock outfit Delicate Cutters shot a man — now lying in the street bleeding out — just to watch the man die. Just another night in New York City, just another gig for the Cutters. Known for their explosive stage performances and violent tempers, the Delicate Cutters arrived two hours late for their headline show at an abandoned warehouse on Delancy Street at midnight. The crowd had already become restless -- having dragged an opening act consisting of three circus men and a Siamese Gibbon named "Rascal" off the stage, pummeling the clowns with bricks torn from the street outside. After several audience members were arrested for lighting fires in the unisex bathrooms beneath the stage the local police force simply withdrew, cordoning off the area in a 25-block radius as plumes of black oily smoke rose up over the East River. I don't actually remember the concert itself as I'd been knocked unconscious just as the band took the stage. From what I was told I was one of the lucky ones. Whoever hit me with the back of a chair trying to escape the onslaught was inevitably killed by the bags of poisonous snakes the band threw from baskets they had lining the stage. I do have a vague recollection of the fiddle player throwing a Molotov cocktail into the rafters of the venue, which eventually ignited the fire which destroyed the children's hospital next door. THE NEXT DAY I managed to talk to some people in the emergency operating room the National Guard set up in the wake of the show. I was triaged out of the M.A.S.H. with my head bandaged and a splint on my arm which covered what looks to me like a bite mark from a large dog. The band was long gone. They had left in their tour buses screaming epithets about "anarchy" and "a people's rebellion" which the government is taking seriously enough that the President has called a press conference for later in the afternoon — suggesting the Government might be able to come to some "accommodation" with the "leaders" of the Cutters. Here in the now eerily quiet streets where soldiers refuse to patrol on foot there are a thousand stories to be told. There was security guard Bobby "Bull" Jeremiah. Six-foot four, 260 pounds, he used to play with the NY Giants until he was sidelined with a knee injury. He now has a permanent scar on his left temple in the shape of a Fender Telecaster headstock which was embedded in his skull by the band's singer in the first or second song of the night (he doesn't really remember). "I was worried about the audience rushing the stage. It never occurred to me that the band would rush the audience. I'm quitting this life, man. I'm quitting." Another young woman who refused to be named said she saw the bass player pull out of his gig bag what she thought were flares "You know, for when you have an accident?" Too late she realized they were actually sticks of dynamite he used to blow a hole in the wall of the club and into the adjoining bank. AS EVENING FELL the blood was mostly run off the streets with the rainstorm. Helicopters fly overhead, their searchlights enforcing a curfew in lower Manhattan. 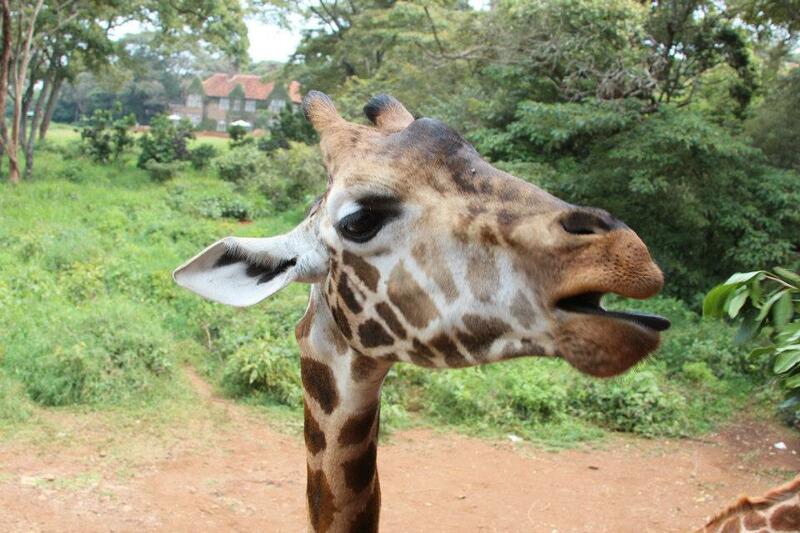 I think one of my molars is loose. What an amazing time and an amazing venue. It was Standing Room Only when the Delicate Cutters performed at the intimate cafe venue in South Slope. And look, they borrowed a T-Mouse guitar. That's my Martin. The very groovy Rabbi Darkside was master of ceremonies and I have it on good faith that the grilled cheese is excellent. What a lovely group of people. This is probably not the last time you will see this giraffe. 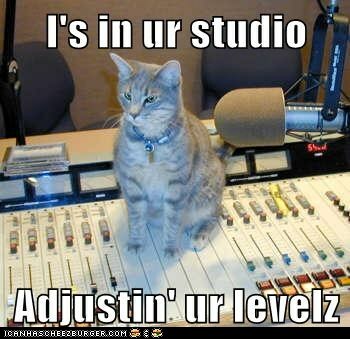 We do need a cat in the studio. Cats are very important. Helpful. They are. Reddit answers the question: why does the "G" string go out of tune first? Remember, Looming Productions. Studio C. You know, for rehearsals. I kind of dig this record "The Sand" by JP Haynie. Listen for free or buy a download. It's all good. Vangelis' scoring studio when he made the soundtrack to Blade Runner. It's sort of the height of analog gear isn't it? I don't even really like the BR soundtrack that much but this is kinda cool. Delicate Cutters are playing New York City in September of 2012. The 26th and 27th. I'll see you then. Sexiness personified Nat Cassidy gives you his Greatest Hits.